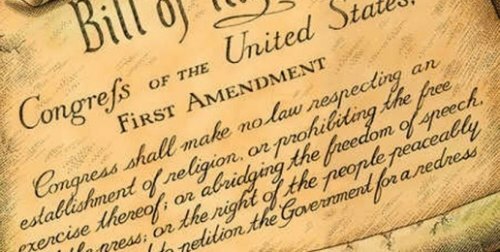 Where do your 1st Amendment rights begin and end? It would seem liberals believe the standards vary based on one’s political ideology. While the so-called “Establishment” clause and the “Free Exercise” clause prohibit government from interfering with our religious rights, the amendment further protects our right of “freedom of speech”. Note, the progressive movement is notorious for vehemently exercising the Establishment clause against Christians who desire the freedom to worship openly. For example, they disingenuously claim that placing a nativity scene or the Ten Commandments in a public venue can somehow be construed as government showing favor of one religion over another and attempting to force U.S. citizens to adopt a “government preferred” religion. Additionally, they conveniently ignore the amendment’s protection of our “freedom to exercise” our religious views without government interference. But only views of Christians! I’ve never heard any progressive lament over an individual being prohibited from exercising the tenets of Islam! In fact, I believe liberals work as hard to protect the Muslim religion as they do degrading Christianity! The hypocrisy is disturbing. Understand, Deep State progressives will leverage and promote only that which supports their liberal agenda. And they will tenaciously fight against anything or anyone who stands in their way. Sadly, until a few years ago, our Tri-State area has been fairly sheltered from these liberal lunatics. But as with any stray critter, if you keep the barn door open long enough, you will attract a variety of vermin. And trust me when I tell you the gestation period of liberal vermin is very short. Before one knows it, they will become an infestation. One only need to look around our city to see our leaders have had the barn door open too long. But, I digress to the “freedom of speech” portion of the 1st Amendment. A recent column by News Editor Tony Rutherford of HuntingtonNews.net, (HNN) an online news agency serving our area since 2000, revealed a fired Cabell County teacher is suing for 1st Amendment Civil Rights violations. Per the HNN column, during the 2016-2017 school year, Mary Durstein taught World Studies, at Huntington High School, where on January 9, 2017, she was called to the office and administrator, Todd Alexander, ordered her to delete her Twitter account which reportedly supported conservative media posts, such as those from Fox News. Durstein posted several tweets and retweets about politics and a variety of other topics and accumulated approximately 20-30 followers of her Twitter account. It’s worth noting, Durstein was active on her account while at home and elsewhere – only when she was not on duty as a teacher. When tweeting and retweeting, Durstein used only electronic devices or computer equipment that she owned. She and her followers tended to like and retweet items of a conservative nature and that supported President Donald Trump and his “America first” agenda. It’s interesting, (but not surprising) that the Charleston paper would intentionally present the story from what I consider to be a “fake news” viewpoint, apparently “slanting” the indeterminate details of the story to fit their progressive agenda. “A Huntington High School social studies teacher who posted numerous hateful views on Twitter deleted her account amid a school investigation of her social media use on Monday.” The columnist went on to claim, “Many posts were Islamophobic”, and that Durstein incorporated profanity when describing Barack Obama in numerous tweets, but showed support for President-elect Donald Trump. Folks, we have two issues at hand here, both of which incorporate the progressive, Deep State assaulting conservatives and their right to the same free speech with which liberals “stain” our society ad nauseam. The attempt to squelch Ms. Durstein’s right to openly state her views in a public venue by a few left-wing progressives is unacceptable and must not be tolerated. Equally as intolerable is the liberal Charleston-Gazette attempting to influence readers of her guilt before the results of any investigation. It’s time to close the barn door and rid our city of the sanctuary seeking vermin. The conservative majority in our area must stand up against this progressive onslaught. Our city leaders and who I believe to be a complicit liberal media, such as the Herald Dispatch and Charleston Gazette, do not seem to be interested in anything but advancing their own progressive agenda. I encourage everyone to seek the truth and stand on principle. It is the only way we can win in what I believe to be the fight of our lives and for our lives.